In the months leading up to my departure for Taipei, I began browsing the weekly billboards of Taiwan for their top 100 songs. I was ashamed, as a Taiwanese-American, to have neglected to integrate more Taiwanese/Taiwanese-American repertoire into my musical tastes. My exposure to Asian/Asian-American music had been limited to the ballads that my parents played in my childhood, the soundtracks of Korean dramas, and Asian-American Youtuber productions. The more Taiwanese and Mandarin songs I listened to, the more I anticipated being absorbed in a musical environment rich with Asian artists. The different languages, rhythms, and melodies, from the clips shared by the billboard recorders, were a revitalizing change from the usual American pop that I often hear. 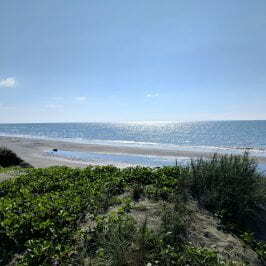 Not long after my arrival, I realized that my expectations could not have been farther from the truth. Western influences were very obvious in the Taiwanese musical culture as the music of American and English artists bled into almost every setting. Everywhere I went—bookstores, department stores, restaurants, and clubs—vibrated with an unexpected familiarity. I was disappointed when the same Mandarin songs would occasionally emerge in the midst of the American mainstream media, as if only the handful of local artists were worthy of being compared to their Western colleagues. With all due respect (and admiration) to Beyonce, Sia, Ed Sheeran, and the like, for attaining international success, I had little desire of spending my time abroad lip-syncing to Western music and had counted on this semester to further develop my knowledge of and appreciation for Taiwanese artists. 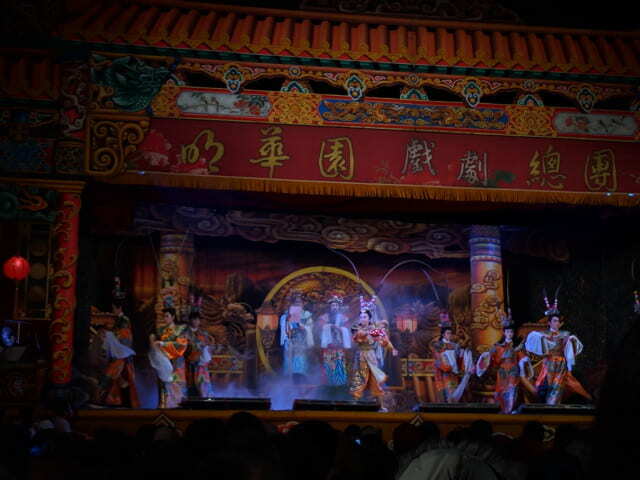 Despite my disappointment with the trace amounts of modern Taiwanese music, I was thrilled to have the opportunity to experience a Taiwanese opera, one of the most traditional forms of entertainment in Eastern Asia. 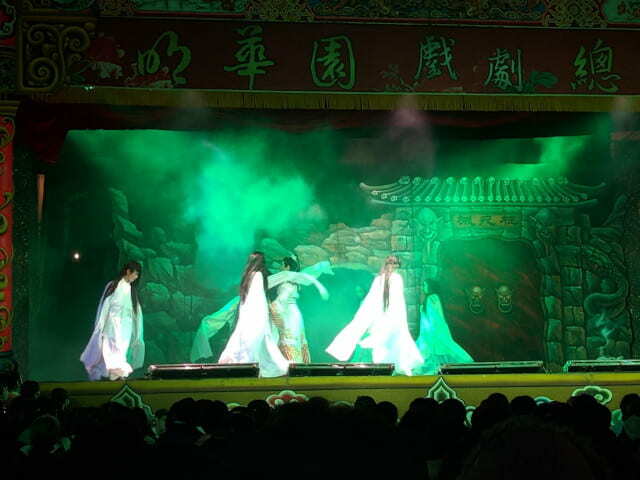 歌仔戲 (Gē zǐ xì, or Taiwanese opera) is reputed to be the only child of traditional drama birthed from this country. “Liu Quan Presents the Melon” (劉全進瓜) is neither the most impressive nor the most suspense-evoking title, but it still earns the title of being the first Taiwanese opera I have witnessed. My father and I arrived an hour and a half early to get seats, and even then, we were not early enough to reserve front row seats. An hour and a half later, I felt fortunate to have seats as later newcomers were left standing behind the rows of seats. I learned that the reason for that day’s horde of people came from the performing group’s fame. 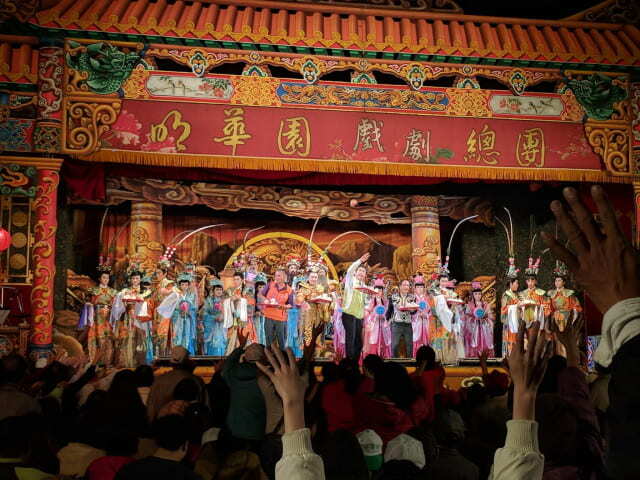 Because one of Taiwan’s most famous theatrical troupes, 明華園 (Ming Hwa Yuan), was putting on the show that day, many were willing to be standing spectators. Usually, 明華園 shows sell costly tickets, but we were lucky enough to attend a free show. 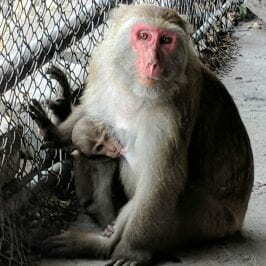 Nothing is truly free; rather, the temple had sponsored the troupe to put on the show to celebrate a powerful deity’s birthday. 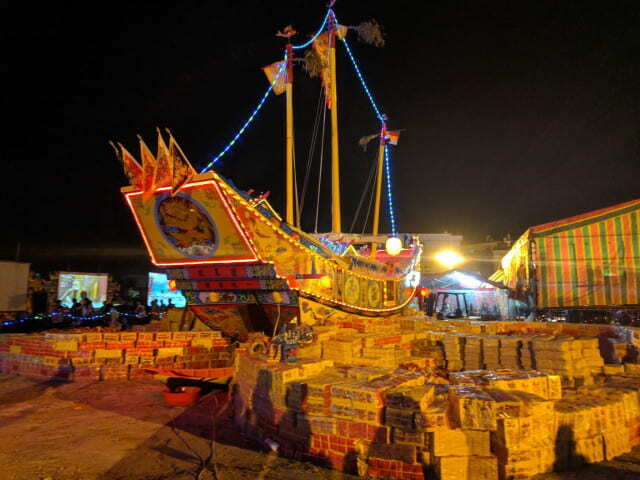 Often, traditional temples will sponsor shows to celebrate religious festivals or birthdays of various deities. 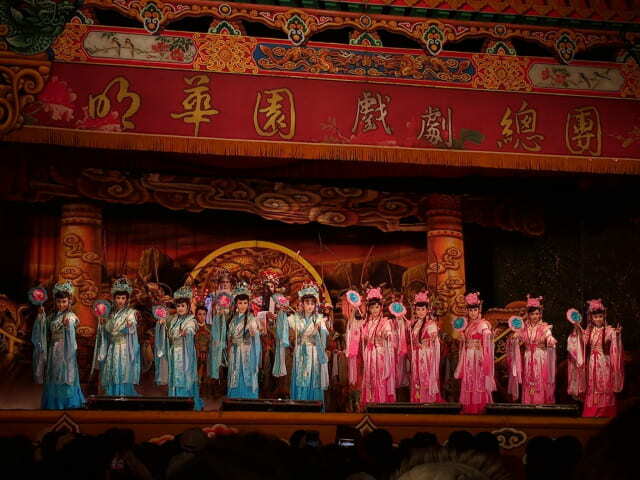 It is believed that the troupe of opera performers can portray deities and allow both performers and spectators to express their gratitude to the gods and pray for continued blessings. 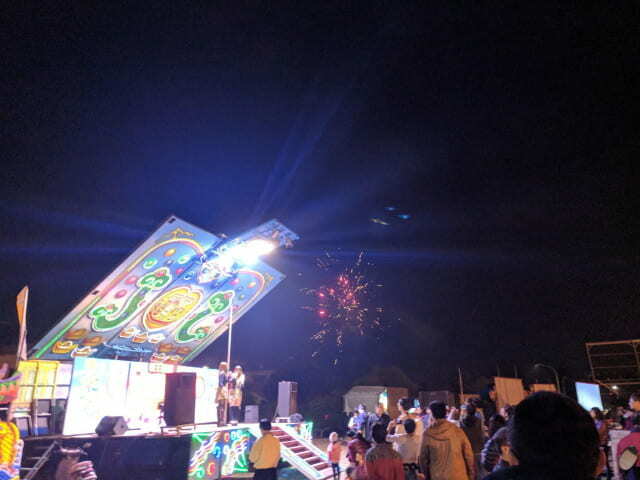 Utilizing the unique energy of these special occasions, the shows have been a way for humans to communicate with the spiritual world. Having paid to experience a 明華園 show the previous week, my grandparents, who were out of town that day, were envious of me. When the performers began belting their verses in Taiwanese, I tensed up, worried that my language abilities were inadequate and would leave me bewildered for the next two hours. My father quickly pointed out the two large screens beside the stage that printed the subtitles. He knew my goals to improve my Taiwanese abilities and jokingly added that being able to watch the opera without the subtitles meant I had mastered Taiwanese. (Later, he admitted that he had to use the screens at times as well to understand some of the dialogue.) Having the subtitles as crutches, I was able to enjoy the story’s plot and learn from its themes about love, family, superstitions, and sacrifices. Taiwanese female ghosts are often depicted as women with long, unruly hair. They are trying to attack the male lead in the center, who has travelled to the underworld to save his wife. Male lead is reunited with his love, the female lead, and they brainstorm ways to escape the underworld together. 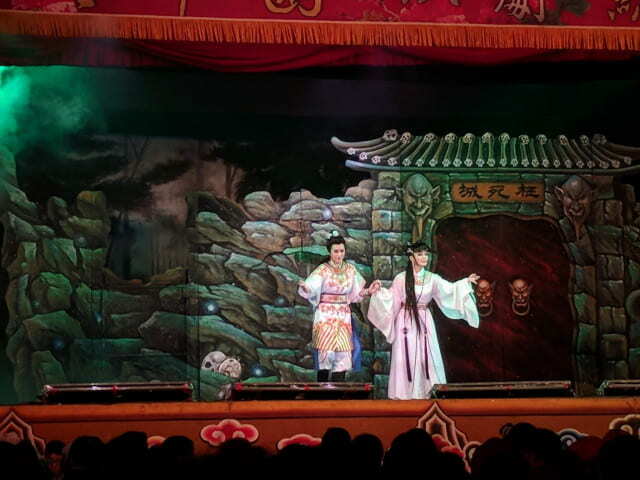 Female and male leads of the performance. You can see one of the two screens with subtitles to the left. The appeal of sitting in the front rows? 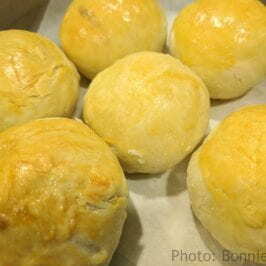 Snagging the peach-shaped buns that have been blessed with divine protection. Introduction of Warriors. Can’t imagine how heavy their costumes must be. Impressive intricate costumes. Name of characters and headgear unknown. Representative of other Taiwanese operas, 明華園’s interpretation of 劉全進瓜 (Liu Quan Presents the Melon) provided a very endearing revival of the island’s history and the cultural folk identity to the audience. Taiwanese operas are not the same as the Beijing/Peking operas depicted in the famous 1993 movie “Farewell, My Concubine”. 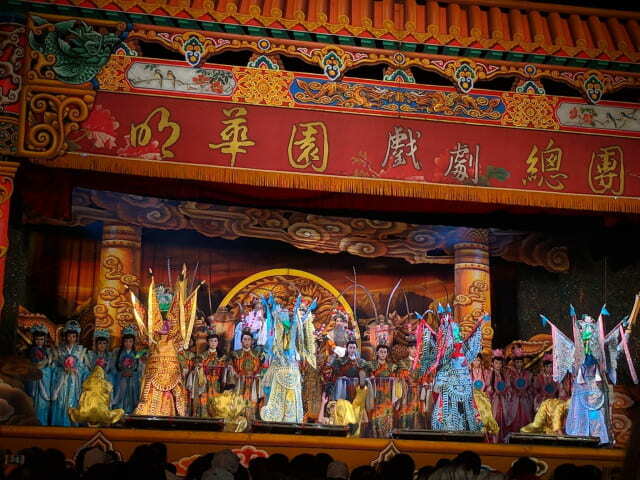 While the younger music scene of Taiwan is largely influenced by Western culture, Taiwanese opera is uniquely Taiwanese and has remained strictly so by only being performed in the Taiwanese dialect rather than in Mandarin. 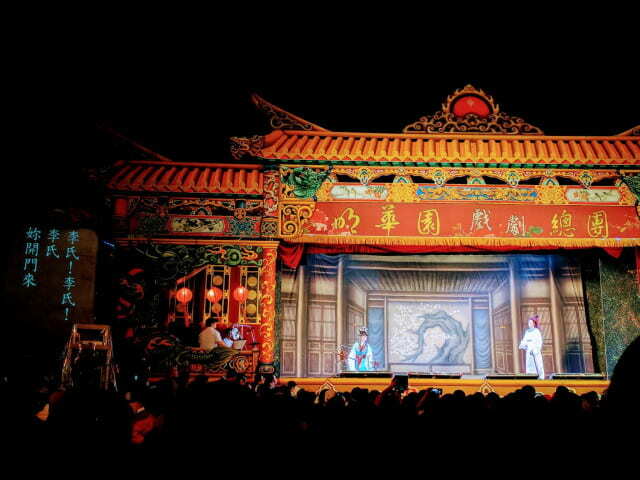 As such, definitely consider adding the native Taiwanese opera to your list of things that symbolize Taiwan. 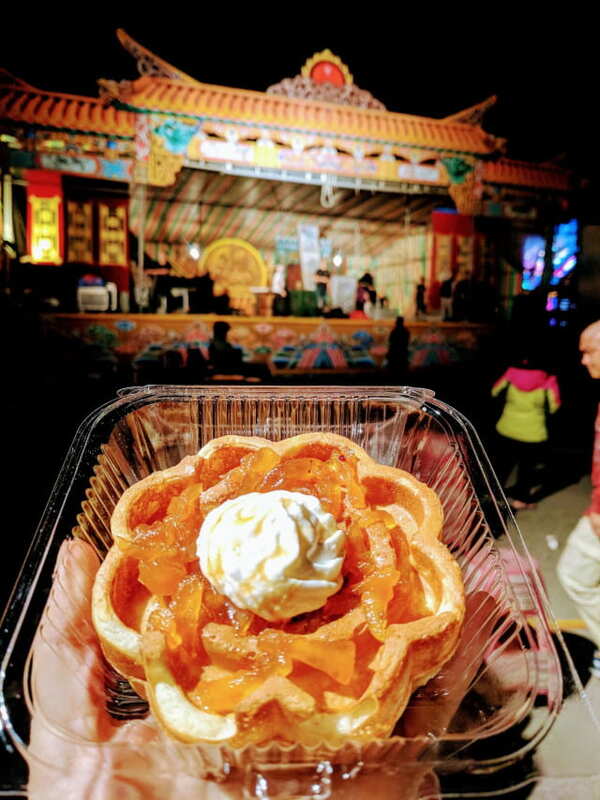 We’ve really got more than Western jams, bubble tea, and night markets going for us!